Whether relaxing in the evening after a hot summer day, keeping busy outside doing yard work or farm chores, or just taking a hike through the woods, bugs have a tendency to ruin your pleasurable experience. We invest money on citronella candles and zappers to keep the pesky bugs away, but we still seem to end up with bug bites. If we are lucky, we only need to put up with the annoying itching and irritation for a couple days at most, but sometimes bug bites can lead to bigger problems if not taken care of immediately. In recent years, ticks have really become an issue. As a mother of two young girls, checking them for ticks has become as common as having them wash their hands before a meal. Both of my children have had tick bites and luckily the ticks were removed properly with no issues; however, several others in my family have not been so lucky and have encountered an infectious disease, known as Lyme disease. The disease is transmitted to humans through a tick bite from an infected black-legged or deer tick. A tick has to be present on the skin for 24 to 48 hours to transmit the infection. One of the scariest things about Lyme’s Disease is most people have no memory of a tick bite. The results of the illness or pathogens transmitted by ticks often begin days to weeks after the tick is gone. After a tick bite, individuals may develop symptoms due to the organism that the tick transmits during its bite. The earlier a tick is removed, the less the likelihood that the tick transmitted any disease. For proper tick identification, it is important to keep the tick by putting it in a plastic baggie with some rubbing alcohol. With tick bites being so common in my area, Lyme’s Disease has been a popular topic at my local Progressive Agriculture Safety Day. Mosquitoes are looked at by many as more of a nuisance than a dangerous insect, but they can spread diseases among both humans and animals including various forms of encephalitis. One of the most common diseases in recent years has been West Nile Virus. According to the Centers for Disease Control & Prevention, 70%-80% of people who actually become infected with West Nile Virus rarely develop symptoms; however, 1 in 5 of the people infected will develop symptoms. Most people with this type of West Nile Virus recover completely, but fatigue and weakness can last for weeks or months. Although the black widow and brown recluse are the only two medically significant spider bites common in North America, almost all spiders are venomous to some degree; however, most venom is too weak or the spider is too small to be a danger to humans. Redness, swelling, itching, and pain are the most common indicators of a spider or other bug bite. If these symptoms continue to get worse over a 24 hour period or you experience additional symptoms it is wise to seek medical attention. For most of these insect bites, infected individuals may experience the following symptoms: headache, fever, nausea & vomiting, sweating, chills, numbness, rash with a “bull’s eye” or “halo” appearance, confusion, exhaustion or weakness, stomach cramps, pain and swelling in the joints, heart palpitations or rapid pulse, and even shortness of breath. The best way to avoid experiencing any symptoms is through prevention of the bite. This can be challenging, but dressing appropriately and using insect repellant can help combat bites. Unfortunately, there are no vaccinations for many of these diseases. Treatment can be as mild as a cream or oral antibiotic, intravenous antibiotics to even hospitalization. If you do get a bite you are concerned about, it is important to document your encounter to get the best results and help identify the culprit. It is helpful to know when you first noticed the bite, when and where you think the bite occurred, and take daily photos of the infected area. It is also important to note if you have been traveling, as diseases common in other areas may not be on your local health care provider’s radar. The most accurate you can be with these answers, the best chance your bite can be identified and appropriate treatment can be determined. What Hosting a Progressive Agriculture Safety Day could mean to your Community? 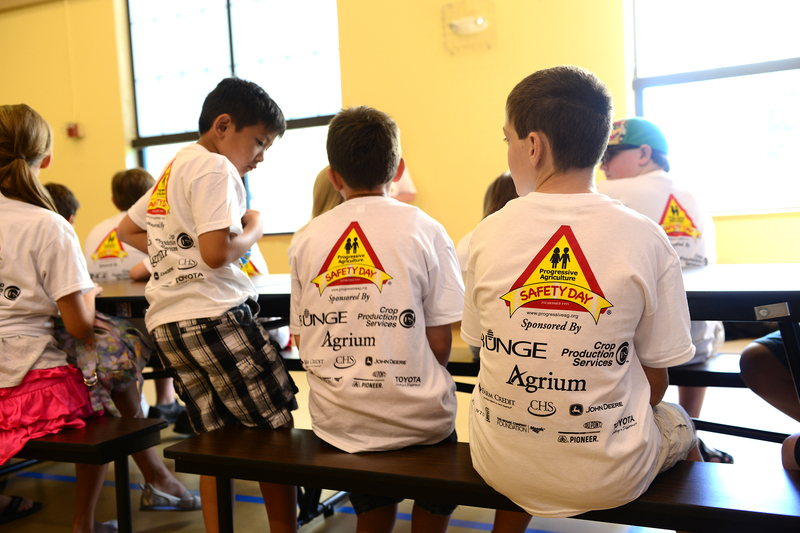 Each year across North America, hundreds of Progressive Agriculture Safety Days take place. Since our program originated in 1995, Safety Days have reached more than 1.2 million participants and volunteers. We continuously strive to make farm and ranch life safer and healthier for children and their communities. No matter the time of year or your community’s size or location, Progressive Agriculture Safety Days are taking place year-round in both rural and urban areas to both large and small audiences. You may be asking yourself, what makes a Progressive Agriculture Safety Day so special? The key ingredient to our program is providing educational training and resources for local communities to conduct a one-day safety and health program. During training, coordinators are given resources on planning for a Safety Day, as well as access to 28 safety-related topics including lesson plans, demonstrations, and age-appropriate, hands-on activities for the participants. From specific farm-related topics including grain bin, tractor, and PTO safety to general topics including healthy lifestyles, fire, ATV, and animal safety, we give you the tools to customize a safety day that fits the needs of your community. From community to school-based Safety Days, implementation of the program around what works best for your area is what makes us so unique. From learning new tips to stay safe both at home and on the farm to shedding light on unsafe practices in hopes of making a positive change, hosting a Progressive Agriculture Safety Day is one of the best things you can do for one of the most valuable resources in your community — the children! In addition to training and resources provided to the coordinator, a t-shirt, take-home bag, and insurance coverage for the day is all provided by the Progressive Agriculture Foundation. We are able to do this year after year thanks to the amazing support of our corporate sponsors, commitment from dedicated volunteers, and in-kind donations of cash and other items at the local level. If you are like me, you will find hosting a Progressive Agriculture Safety Day as one of the most rewarding experiences you will even have. Hearing success stories from how old, unsafe practices were changed to new safer practices to how a lesson helped save a life or prevent an injury, really help put into perspective exactly why this program is so dynamic. Who can be a coordinator? Anyone with a passion and interest in helping their community be safer and healthier. Our coordinators range from Extension Educators, school teachers, 4-H leaders & FFA advisors, Individuals working in a health or safety-related field, retirees, and community leaders to name a few. Do you want to host a Progressive Agriculture Safety Day in your community for 2015? Visit our website at http://www.progressiveag.org/, click on the “Apply Now” button, and tell us about plans for a Safety Day in your community. You will be notified by early-fall if your request to host a Safety Day has been accepted! Hurry —- the deadline to apply is July 15, 2014!